It's easy to forget just how awful mobile phones used to be - but one look at the Motorola 4500X serves as a reminder that mobile phones were once something that you really didn't want to carry around unless you had to. 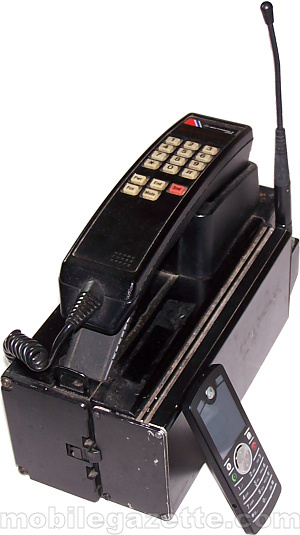 Dating from the late 1980s (we believe that our model is a Vodafone UK device from 1988), the 4500X was a massive 3.5kg device which was basically a handset connected to a heavy box containing the battery and electronics via a curly cord. The unit measures 260mm long by 118mm wide by 175mm tall (270mm if you count the antenna). This type of phone was known as a "hand portable" and it was just one step up from a car phone. The handset itself had a basic set of numeric buttons and some function keys, with a very simple LED display for output. There are no letters on the keys, because text messaging was still to come. 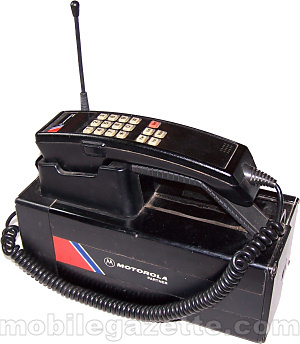 It wasn't the first commercially available phone - that was another Motorola handset, the DynaTAC (which we spoofed a few years ago for April Fool's Day) - but the 4500X wasn't much more advanced, the real innovation was the curly cord that meant you didn't have to strain yourself too much while talking on the phone. It's hard to get an idea of just how big these things were - so on the left we have included a Motorola FONE F3 as a comparison. Even though the FONE F3 is about the most basic phone on the market today, it is still much more powerful than the 4500X. And at just 70 grams, it comes in at just 2% of the weight of its ancestor. Surely something the size of the 4500X must have had something going for it? What about battery life? Nope - maximum talktime was perhaps an hour, and the 4500X needed pretty much continual charging to keep it going. People who had to use one of these things needed to plug it into their in-car charger between site visits to try to keep the thing going. What about call quality? With a big antenna like that, surely the Motorola 4500X must have had crystal clear calls? Nope - this ran on the old analogue ETACS system which was appalling, no matter how big the antenna might be. In fact, the Motorola 4500X was the last of the first generation of mobile phones. Shortly after the 4500X and its contemporaries, Motorola came out with the MicroTAC which weighed in at "just" 350 grams which started the trend for phones to become ever smaller, leading in time to the StarTAC which more-or-less defined the shape and size of a modern clamshell. The "curly cord" phone didn't die though, it evolved into the Bag Phone which is still available today.. the latest incarnation is the Motorola M900 Bag Phone. You might note that all of these early handsets were from Motorola - Nokia didn't really make much of an impact in the early days and Motorola was regarded as the main innovator in the mobile phone industry. Times change. You can see more of the Motorola 4500X and some contemporary office equipment in our gallery.